Yesterday, Gulfstream kicked off Live Well. Be Well. 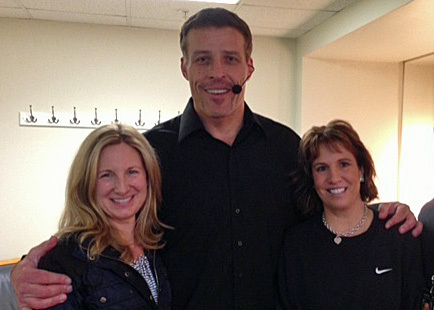 with Tony Robbins. The program encourages the community to develop healthy habits and healthy relationships by raising awareness of the essential links among physical, mental and financial health. They have an impressive list of speakers lined up in addition to Tony Robbins-- Suze Orman, Dr. Oz, Maria Shriver, Martha Beck. They're making these sessions available to the Savannah community for a nominal fee with all the proceeds going to non-profits in the Savannah area. I've been hearing more talk in the workplace wellness community about involving the community, but I've not heard of any initiatives like Gulfstreams. Hats off to Jennifer Giffen, Gulfstream's VP of HR. Laura and I with Tony Robbins. They kicked off the speaker series with Tony Robbins to help people get the most out of everything they learn through the rest of the program. He focused a lot on energy. The type of energy that can be gained from a healthy mindset and a healthy way of life, the kind of energy we project on others, and he created a rock concert like energy in the room. I looked for some insights to share with you as we embark on our 30 Day Mediterranean Lifestyle Challenge. See things as they are, but not worse than they are. People don't have a break through because their story gets in their way. If you tell yourself you don't have time to eat well and exercise, it will become a self-fulfilling prophecy. Divorce your story and marry the truth. As you prepare for our 30 Day Challenge, take a few minutes to assess your current situation. Decide what you going to focus on and focus on what you can control, not what you can't. Wherever you focus, your energy will flow. For example, focus on all the good foods you can eat, not what you can't. Who you spend time with is who you become (unless you become a leader.) It's not because people are too weak to resist the tide of the group, but because they are busy and find themselves being nudged in the wrong direction when they're not paying attention. Look for role models, people that lead the kind of life you want to lead, and spend more time with them. The one health tip he shared -- take one teaspoon of virgin coconut oil three times per day to curb sugar cravings. I swung by GNC on the way back to the hotel. I'll let you know how well it works for me. And, a real highlight from today, we met Aidan, a 12 year old inspiration.